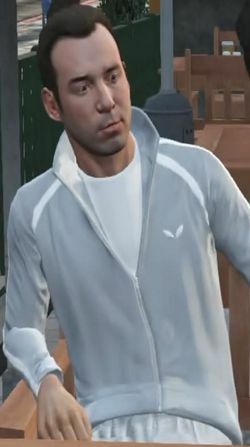 Fabien LaRouche is a character in the HD Universe who appears as a minor character in Grand Theft Auto V.
Fabien LaRouche grew up in a small town in France but moved to San Fierro in 1999 as the towns people could not accept that he was 'flamboyantly camp and fiercely heterosexual'. He later moved to Los Santos after being charged with unknown crimes, although these were never proven. After a personal crisis he was 'saved' by yoga in 2002, studying under Chidaatma Shashikanth via audio books. In 2009 he spent three months in solitude, except for social media and getting coffee, where he learned to feed himself individual blades of grass with his toes. He came to believe in sharing the human spirit, resulting him not becoming 'sexually self-sufficient' as he is able to touch any part of his body with any other part of his body. By 2013 he had become a private yoga instructor and began working with Amanda De Santa. In one of his sessions with Amanda he encourages her husband Michael to join them after he sees the two having an argument with Fabien believing a yoga session would help them. Michael agrees and successfully performs three yoga poses. After seeing Fabien and Amanda doing a sexually suggestive pose, and after learning of affair with tennis coach Kyle Chavis, Michael attempts to push Fabien into the pool. Fabien, however, dodges and Michael falls in instead. Amanda, calling Michael a pathetic psycopath, leaves with Fabien saying that she will not come back. Michael, attempting to repair his family, travels to Bean Machine in Vinewood with his son Jimmy. He sees Fabien and Amanda sitting together with Michael demanding that Fabien shows Amanda a little respect. Michael, losing his patience, grabs a nearby woman's laptop and hits Fabien with it. Amanda, agreeing to return to Michael at their house, drives Fabien home before meeting Michael, Jimmy and Tracey at Dr. Isiah Friedlander's office. True to Rockstar Games' humour, Fabien's yoga positions featured in the "Serenity & Wellness" section of the official GTA V website are sexually suggestive. Fabien LaRouche can speak French, English and 'bastardized' Sanskrit. Fabien charges $2,000 for six private classes. A pre-release screenshot of Fabien La Rouche. This page was last modified on 22 December 2014, at 20:15.